I have a 1988 Trek 660 I have owned since new. Two years ago, I replaced the rear hub, cassette and bottom bracket after they all went bad within 6 weeks of each other. Ever since then, I have had a very intermittent skip ( it only happens about once every 40-50 miles or so). It happens sometimes under load, sometimes not. It seems to come from the bottom bracket area. The Trek mechanic can't duplicate it. Any suggestions? try to explain "skip" a little better. do you mean pedal stroke with no forward power? (04-26-2011, 02:07 AM)painkiller Wrote: try to explain "skip" a little better. do you mean pedal stroke with no forward power? Yes that is correct. It only lasts for a fraction of a pedal stroke and the everything is smooth 7 normal again. Yes, there is a pedal stroke with no power. It is only a partial stroke that this happens, then it is back to smooth & normal pedaling. Thanks. Check the chain for wear using the method Alex has on this site. If that's not it, then check chainrings and the crank interface (could be worn). Do you ride in one gear most of the time? that's more likely to cause the skip, as the old chain bedded into the dead cassette, so the chain doesn't fully mesh with the new cassette properly. That's all I can think of. No, I change gears frequently and I just replaced the chain last week & only have one ride on it. It still did it, so I am going to replace the cog on the rear. Suggestions? 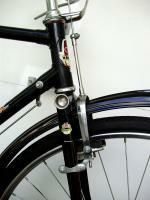 Maybe try increasing the cable tension by 1/4-1/2 of a turn from either adjuster (turn anticlockwise). If that makes it worse, undo what you did and then loosen it 1/4-1/2 a turn.